It is commonly believed that New Year’s Day is less important in England than Christmas but I should admit that nowadays the welcoming of the New Year is growing in popularity, particularly among younger generation. Of course, teens prefer to spend Christmas with their families, but to be honest, they enjoy New Year’s parties all night through mostly with their friends. New Year celebrations in Great Britain are closely connected with the customs and cultures hold by British people. This day was officially declared as New Year’s Day in 1752. New Year is a time for celebrating and for making a new start in life. People wish each other ‘Happy New Year’ and often send special greeting cards. In recent years these cards have been replaced by colourful e-mail messages. In Britain many people make New Year’s resolutions. This involves people promising themselves that they will improve their behaviour in some way by giving up bad habits. People might decide to give up smoking, for example, or to go on a diet. These promises are often broken in the first few days of the New Year, however! And what about you? Have you made your New Year's resolutions yet? And help my sister, father and my mother. The 31st of December is New Year’s Eve and is a more important festival in Scotland than in England that’s why a lot of people head to Edinburgh for New Year. The capital of Scotland is home to some of the world’s most famous New Year celebrations known locally as Hogmanay. According to the Guinness Book of Records the largest New Year party in the world took place in Edinburgh in 1996—1997 with approximately 400, 000 people in attendance. Nobody knows for sure what the origin of the word “Hogmanay” is. Some people say that the word is derived from the name of an oak cake and is connected with provision of food and drink for all visitors to your home on the 31st of December. Others are at the point of view that the word means “Holly Month” (Haleg Moneth). After midnight people visit their friends and neighbours. It was believed that the first person to visit one’s house on New Year’s Day could bring good or bad luck. Therefore, people tried to arrange for the person of their own choice to be standing outside their houses ready to be let in the moment midnight had come. Usually a tall, dark-complexioned man was chosen, and never a woman, for she would bring bad luck. The first footer was required to carry three articles: a piece of coal to wish warmth, a piece of bread to wish food (nowadays it is usually a black bun, a kind of fruit cake), and a silver coin to wish wealth. The visitor, in turn, was offered a small whisky. You can also take part in Hogmanay fire street festivals which are annually held in Scotland. 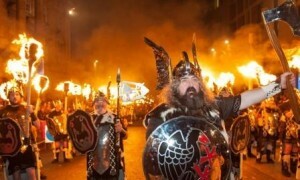 Scotland’s fire festivals may have pagan or Viking origins. The main idea of these festivals is to use fire for purifying and driving away evil spirits. So, fire is at the center of Hogmanay celebrations in many cities in Scotland. One of the most famous and dramatic event takes place in the town of Stonehaven at the North Sea coast. Festivities start at about 11 p.m. There is usually a band of pipers followed by very wild drumming. At least 12,000 spectators line the route of the event. At the stroke of midnight from 45 to 60 strong Scots, wearing kilts, light up the high street by whirling balls of flame around their heads. Showers of vibrant sparks are sent into the watching crowd. Each participant makes his own fireballs and keeps the recipe secret. The point is to create a fireball that will burn brightly as long as possible! At midnight throughout Great Britain people celebrate the coming of the new year. They sing “Auld Lang Syne”, an old Scottish song that has become popular all over the world. The words are partly traditional and partly by Scotland’s most famous poet, Robert Burns. He wrote much of his poetry in the Scots dialect of English. The first verse and chorus are usually sung with everyone holding hands in a circle. On the second verse, everyone crosses hands in front, giving his right hand to the person on the left and his left hand to the person on the right. За дружбу старую до дна! Recently New Year parties in London have become big in scale and massive in celebration. In London people gather to see the new year in in Piccadilly Circus and Trafalgar Square waiting for Big Ben to strike twelve. When it is almost midnight people are very quiet but when Big Ben begins to strike they all start cheering, blowing whistles and automobile horns, shooting firecrackers and greeting each other with ‘Happy New Year’. People hug and kiss total strangers and even the police who are there to control the crowd but in such an atmosphere it is very difficult, and there is always someone who ends up in the fountain in the Square with all their clothes on! Unfortunately January 1st is not a public holiday in England. Can you imagine New Year celebrations without a fireworks show? London always attracts lots of tourists from all around the world. So, don't miss a chance to witness the most exciting and prominent fireworks show which is an inseparable part of New Year celebrations for no less than a million people every year. 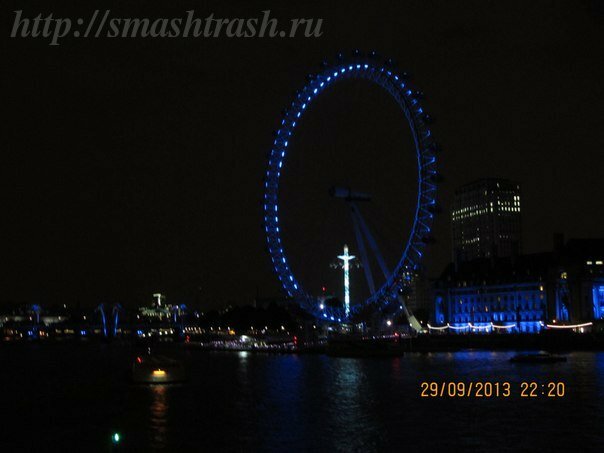 As soon as the Big Ben clock rings twelve at the midnight, the fireworks show begins at the London Eye which is situated on the south bank of the river Thames. The duration of the show is just 10 minutes but it makes you remember these breathtaking moments for a long time. 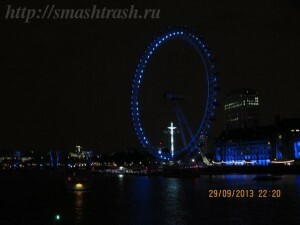 To have a better view, you may stand on Westminster Bridge or the north bank of the river. If you are not lucky enough to visit London for New Year celebrations, don’t be upset because BBC usually telecasts the show for its worldwide viewers. May the joys of this season be with you throughout the coming year! Эта запись написана автором Елена Шрамкова, 30.12.2015 в 17:26, и размещена в категории Традиции и обычаи Великобритании. Следите за ответами на эту запись с помощью RSS 2.0. Вы можете написать комментарий или разместить обратную ссылку на своем сайте.